A new spot to score donuts and more has opened its doors in the neighborhood. Located at 3157 W. Holcombe Blvd. in Braeswood Place, the newcomer is called Duck Donuts. This new spot--which has locations throughout the Eastern seaboard, Texas and one on the way in Southern California--specializes in fresh, made-to-order donuts, ice cream sundaes, coffee, and sandwiches. In addition to featuring signature donut flavors like blueberry icing with maple drizzle and powered sugar or chocolate icing with mint drizzle, Duck Donuts has a build-your-own donut ordering component as well. Start with a plain cake donut, coat it with your choice of icing flavor like lemon, vanilla, or peanut butter; add toppings like sprinkles and shredded coconut; and finish it off with a drizzle of hot fudge, salted caramel or raspberry. 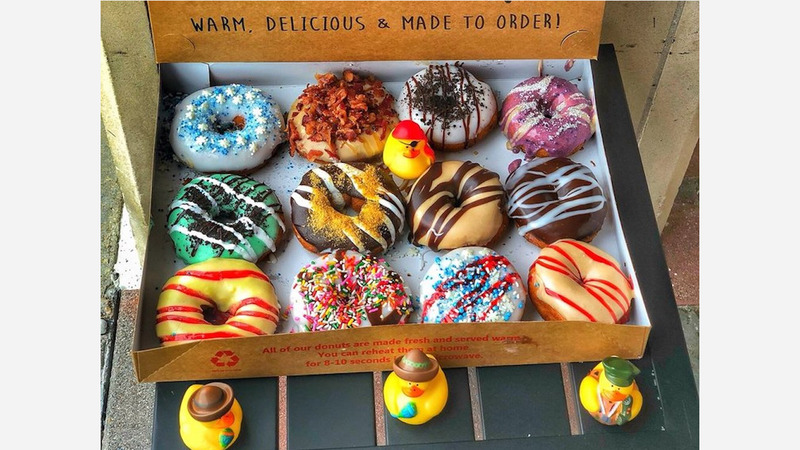 Duck Donuts has proven popular thus far, with a 4.5-star rating out of 13 reviews on Yelp. Woo K., who was among the first Yelpers to review the new spot on January 14th, said: "Absolutely. Delish. The donuts are so soft and moist. The icing and flavors are just harmony. The staff was super fun. I loved the place so much I even bought a rubber ducky!" Yelper Nora C. added: "Stopped by tonight because this donut place was on the way home. There is plenty of parking around the lot. When I got out of the car and I was hit with the smell of donuts (right in front of the store)." And Ritza A. said: "I'm so excited that a Duck Donuts opened in Houston! I first tried Duck Donuts a few months ago in Virginia and fell in love. So in love I thought maybe I should open my own location in Houston, but after research I found out that one was on the way." Swing on by to take a peek for yourself: Duck Donuts is open Monday-Wednesday from 6am-3pm, and Thursday-Sunday from 6am-7pm.